Nano (L) and Antonio (R) are two of New York’s most recognizable athletes. 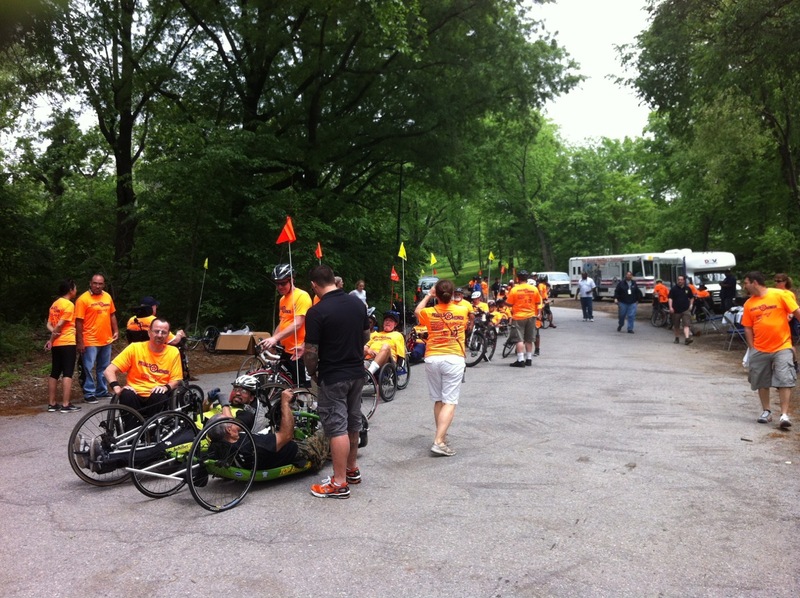 They lead an 8am Saturday morning hand-cycle training ride in Central Park. In upper left hand corner, left to right, Robert Matson, Joe Traum and Sze Wing Kwok speak with an athlete about hand cycles and an upcoming race. 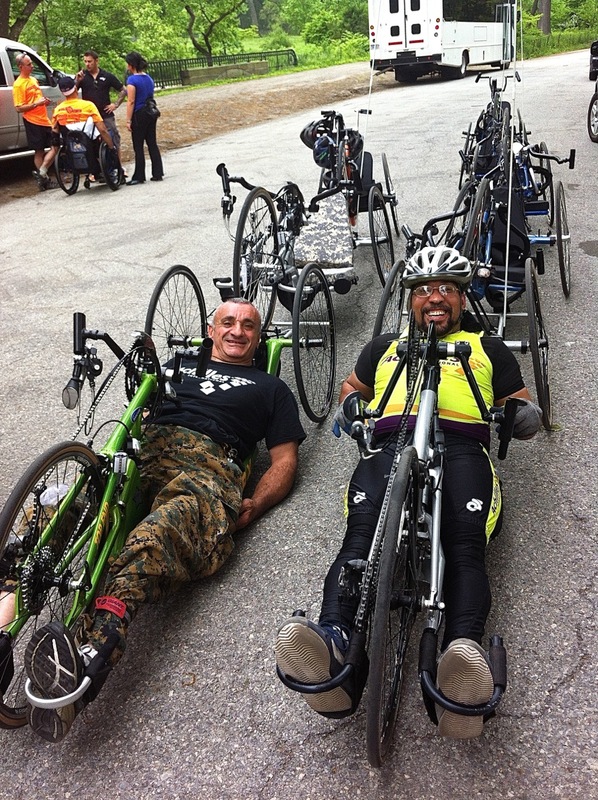 Today I assisted with the recumbent trikes at the Pedals of Honor program from the VA Veterans Integrated Service Network 3 Adaptive Sports Program. 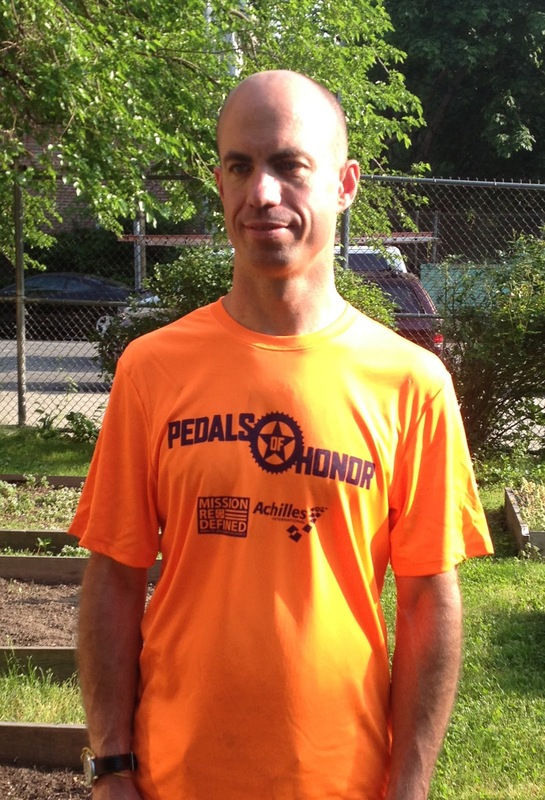 Neile Weissman, New York Cycle Club’s ‘bent-riding ride leader extraordinaire, helped. The HP Velotechnik Gekko fx seemed to be the favorite trike foot-cycle. to start asking people for photos, while the action is…in action. What is “Pedals of Honor”? “Adaptive sports are an amazing way to facilitate overall health and wellness while providing an opportunity for our New York and New Jersey Veterans to explore the city in ways they haven’t before,” said Leif Nelson, Prosthetics Clinical Coordinator at VA New York Harbor Healthcare System, which houses the VISN 3 Prosthetics Program. Here is a review of HP Velotechnik’s Scorpion fs 26 by Bryan Ball, from Bentrider Online. Trikes are more popular in non-urban regions of the country than they seem to be in New York/DC/Boston/Philly, but they certainly do have their following. It’s been cool to see more trike customers visiting, in addition to the 2-wheel crowd. I have a HP Velotechnik Gekko fx demo model in stock. I received and built it several weeks ago, but only got to ride it myself for the first time last weekend. OK…OK…once again, HP Velotechnik blows off the lid. It’s a great machine. Every time I receive a new HP Velo, I just want to retire and spend all my time touring on whatever they just sent me. While the Gekko fx lacks the exceptionally fine handling of the Scorpion fs, it’s no slouch, with a tight turning radius, a high seating position — seat height is 13″ — so you don’t feel invisible on the roads, and the usual HP Velo stability. And of course it goes as fast as you want to peddle. To make up for the lack of full suspension, we built this one up with Schwalbe Marathon Big Apple tires and they really give a great ride — both that air cushioning and the amazing grip. SRAM/Avid have improved their disc brakes as well, so the BB5’s aren’t bad. Don’t overlook them. A second Gekko fx will arrive at the end of April. Otherwise, new German-built machines are taking about 8 weeks to arrive in New York due to demand and manufacturing backlog. As for the Scorpion line-up, they are being built much more quickly, with delivery in as little as three weeks (though that can change). The USA Gekko fx’s, with the slightly lower spec, are slated to be offered in June, but no exact date has been set. All this to say, if you want your trike sooner rather than later, consider buying a Scorpion. They aren’t that much more expensive than the Gekkos and, like all HP Velotechniks, they’re worth every penny. Better yet, for day-riders, tourers and commuters, they use the traditional HPV rack designs. However, if you need the tight, fast fold (and what city-dweller does not), the Gekko fx remains your machine; you’ll simply need to wait for it.